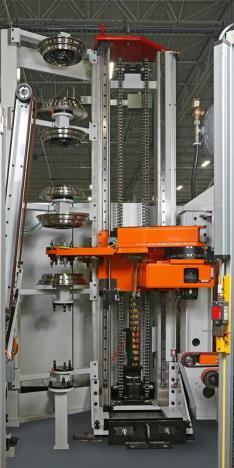 The ASTEC® FX Automatic Rim Changer (ARC) is specifically designed for use with the ASTEC® FX Tire Uniformity System. The ARC performs tooling changes in a quick and efficient manner, without physical lifting or operator intervention. The ARC is capable of both automatic tooling changes, driven by information from the ASTEC® FX, and operator assisted tooling changes, managed through the ASTEC® FX operator’s pendant. No Lifting Required by personnel. This is a key safety feature for many tire manufacturers. This also prevents potential damage to tooling sets. Quick and Efficient. Cycle time and manufacturing flexibility are key issues for tire manufacturers. The ARC is the correct equipment to use with ASTEC® FX for minimizing down time when atooling change is required. Easy to Install, Use and Maintain. The ARC is provided with onscreen operations, simplifying operator and technician management of any tooling changing process. The ASTEC® FX human machine interface (HMI) displays all functions during the ARC process.